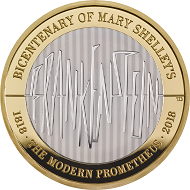 October 25, 2018 – The Royal Mint is celebrating the 200th anniversary since the publication of Mary Shelley’s novel, The Modern Prometheus, with the launch of a £2 commemorative Frankenstein coin. Mary Shelley’s novel is a classic of modern literature and The Royal Mint celebrates this on an official UK commemorative coin. Arguably the most iconic portrayal of Frankenstein: Boris Karloff in the 1931 screen adaptation. On a stormy night in 1816, a group of friends gathered at a villa on the shores of Lake Geneva to tell each other ghost stories. The company, including the poets Lord Byron and Percy Shelley, had been discussing the latest scientific controversy – was human life simply biological or did it contain ‘the divine spark’ of God? That night Mary Godwin (later Mary Shelley), experienced a fevered dream about the birth of a terrible creature that was to become one of the most famous horror stories ever written. Great Britain / 2 GBP / silver .925 / 12 g / 28.4 mm / Design: Thomas T. Docherty (reverse) / Mintage: 4,500. The Frankenstein coin was designed by Thomas T. Docherty a member of The Royal Mint Coin Design team. Thomas’ ‘spark’ of inspiration came from the power of Mary Shelley’s words bringing her monster to life. Thomas used this to create his own interpretation of the ‘spark of being’. 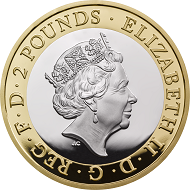 The coin is available in Brilliant Uncirculated, Silver Proof, Silver Proof Piedfort and Gold Proof finishes. For more information please visit The Royal Mint website. A free audio book version of Mary Shelley’s Frankenstein is available on YouTube. 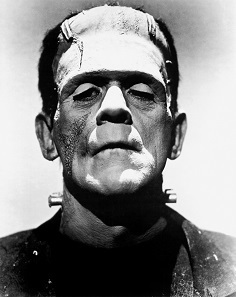 Here you can watch a short extract of the 1931 movie version of Frankenstein.